No standards exist for microgrids that address reliability, connection to the grid, efficiency and other issues, says Michael Overturf, CEO of ZF Energy Development. His firm has partnered with the Perfect Power Institute to provide LEED-like standards for these facilities, located in campuses, medical facilities, industrial plants and other areas. ZF Energy is now applying these standards to some of its projects. Joining Overturf in this podcast is John Kelly, executive director of the Perfect Power Institute. A Grid of Microgrids for Washington, DC? What Color is Your Microgrid? Why HP Hood Installed a 15-MW Industrial Microgrid: Hint. Milk Sours. In this paper, new voltage sensitivity indexes are proposed to search and evaluate the candidate buses in a microgrid, where the energy storage systems can be installed to contribute most effectively to the system. 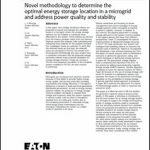 To learn more about optimized energy storage in a microgrid download this white paper.